I don’t know about you all but I am not ready for summer to end. Sure, by the time September rolls around I’m always itching to bake something with pumpkin, But, right now, I’m savoring every last bit of summer! This past weekend, I made the most of a beautiful weekend by attending some free yoga at the Lincoln Park Zoo in Chicago. I hadn’t practiced yoga in quite some time, but the views were stunning and the class was perfect in the outdoors. Then, I perused the Green City Farmer’s Market with BreAnna of Crafty Coin. If you don’t attend farmer’s markets during the summer, you most definitely should. There are a ton here in Chicago and I’m sure you can find some in your area too! I love walking around, seeing what fruits and vegetables are in season, and getting to know the people that make our food. This past visit, I grabbed some fresh flowers and these beautiful ripe peaches. If you didn’t already know, August is national peach month. So what better what to celebrate than to cook with peaches! After my farmer’s market haul I took to Instagram to ask my friends for ideas of what to make with my new peaches. The ideas were abundant and great: peach muffins, baked peaches, sliced peaches on toast, and PEACH ICE CREAM. As soon as I saw this suggestion, I knew exactly what I was making. A vegan and refined sugar-free version of peach ice cream. This ice cream is luscious and creamy, you wouldn’t really know there is actually no cream in the recipe. The base is a combination of coconut milk, to give it is creaminess, and almond milk, to help keep the coconut flavor subtle. The ice cream is sweetened with the peaches themselves and some dates. You could always add more sweetener to suit your tastes, but I like it slightly sweet, to really let the peaches shine through. I absolutely adored this vegan peach ice cream. So much that I couldn’t stop eating it before I put it in the freezer to chill completely. I can’t wait to try it on top of some warm blueberry crisp (or just with a spoon straight out of the container). But we’ll keep that as our little secret. 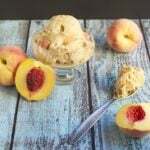 This vegan peach ice cream is super creamy without any of the dairy! Fresh peaches are used in this recipe to get the most delicious flavor. Gluten-free, dairy-free and vegan. In a saucepan over medium heat, combine coconut milk, almond milk, cornstarch, cinnamon, salt and vanilla. Whisk occasionally for about 5 minutes. Transfer to a food processor or high powered blender. Add 2 cups of peaches, lemon juice and vodka. Blend until smooth and creamy. Add to an ice cream maker and churn according to manufacturer's instructions. Transfer to a freezer safe container. Fold in (optional) diced peaches if using. Freeze at least 4 hours. Allow to soften slightly on the counter before serving. This recipe was shared on Allergy-Free Wednesdays and Welcome Home Wednesdays. Bahaha I knew you would! Here are my thoughts on making it without an ice cream maker… You basically freeze it without the ice cream maker just in a container. Then you let it sit on the counter until it’s at least able to be cut up but still frozen. Add the chunks to a high powered blender and just blend until smooth… Should still be thick. Layer in some peaches for some texture! YUM! This looks delicious! My husband and I are dairy intolerant, so I’m definitely going to have to try this one! Thanks Ashlie! I’m also dairy intolerant so I’m so glad you stopped by! I hope you and our husband enjoy it! Thanks for linking this up to the Welcome Home Wednesdays link party! OH MY this looks yummy! What a perfect treat for the summer! Thanks for sharing…we hope to see you again next week! Okay my mom would LOVE this… peach ice cream is like her guilty pleasure. She absolutely loves it! I will definitely have to try this with her! Thanks for linking up with us at Welcome Home Wednesdays… can’t wait to see you next week! Great recipe. I don’t have an ice cream maker, but I’ll try the variation that you offer in the comments! I enjoyed finding you on the Welcome Home Wednesdays link party! Vodka?! I’m in! jk 🙂 This looks soooo good. Peaches are the best this time of year! Hahah too funny!! I bet bourbon would also work well for a bit of extra flavor 😉 but yes!! Peaches are amazing right now! This looks amazing! I’ve really been liking peaches lately so I may have to make this! YUM! I can’t wait to try this recipe, and thanks for your tip re: no ice cream maker! I love everything peaches and this heatwave calls for ice cream! I can’t get enough of peaches lately! Let me know how it goes if you try the no ice cream maker approach! oh my word! That looks way yum! This is great! Although, I dislike peaches I can substitute it! I was vegan for a week and still trying to practice it.. I wrote about it on my blog. I am naturally lactose intolerant so just adding this to my recipes. Exactly! You can definitely substitute any fruit you want! I’m not vegan personally but do eat vegan quite often since I’m unable to eat dairy or eggs. I love incorporating vegan foods into my diet! This looks super yummy! I can’t wait to pick fresh peaches and give this a try.. I’m a sucker for ice cream! This looks so good! Perfect for the end of summer. Thank you Shannon! It really is a great end of summer treat! Yum. Well this looks delicious! I want to try this. Thanks Elizabeth! It’s one of my favorite ice cream flavors! Thanks Kam! It is a great end of the summer treat! This looks absolutely amazing! Always looking for healthier desserts. Thanks!! Looks great! Is there an alternative to the vodka to make it not be so rock hard? Thank you!! I only have experience using alcohol myself but I have heard gelatin, pectin or adding corn syrup or additional sugar can help keep the ice cream from freezing too hard. I let mine sit in the refrigerator for 20 minutes before I want to eat it so that it softens up a bit. Another amazing dessert! I am on a paleo diet, so I might try tapioca starch instead of corn starch and see how it goes. Thank you for the recipe. That would for sure work! I do it all the time! Tried to make this but it was way too runny to become ice cream. 1 cup unsweetened almond milk is not included in your other ice cream recipes so my guess is that this is the difference. Can you confirm that you actually added this much additional liquid and made ice cream from it? Unfortunately we wasted a lot of expensive ingredients trying to make this goo. Hi there, I’m so sorry this didn’t work out for you. I did indeed use 1 cup of unsweetened almond milk in addition to the coconut milk in this recipe. My only thought is that maybe your coconut milk was too runny? Did you use the type in the can or the box? Which brand did you use? Also, just want to confirm that you did freeze it after blending it in an ice cream machine? Let me know how I can help! We did use the proper ingredients – same as we used for your vegan pineapple ice cream recipe which came out great. We liked the idea of using dates as the sweetener for this one so decided to give it a try. It never came close to forming ice cream – just stayed a liquid. We didn’t bother putting it in the freezer afterward. In retrospect though, it may have made a good shake. No worries.